to and from the station to meet every train. at the hotels and station, to meet every train. Whit Tuesday, July 26 and 29, and November 27. 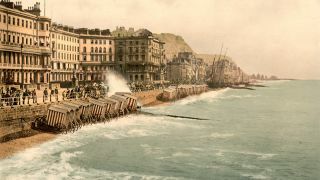 The recognised salubrity and mildness of the air, together with the openness of the coast and the smoothness of the beach, have long made Hastings a favourite and a recommended resort. The shore is not abrupt, and the water almost always limpid, and of that beautiful sea-green hue so inviting to bathers. The constant surging of the waves, first breaking against the reefs, and next dashing over the sloping shingle, is not unwelcome music at midnight to the ears of all who sleep in the vicinity of the shore. Dr. James Clark states, that in winter Hastings is most desirable as a place of residence during January and February. During the spring also it has the advantage of being more effectually sheltered from north and north-east winds than any other place frequented by invalids on the coast of Sussex. It is also comparatively little subject to fogs in the spring, and the full of rain may be said at that time to be less than on other portions of the coast. 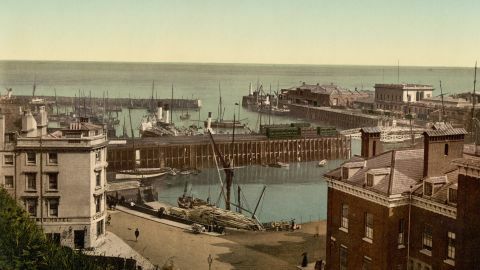 As might be expected from the low and sheltered situation of Hastings, it will be found a favourable residence generally to invalids suffering under diseases of the chest. Delicate persons, who desire to avoid exposure to the north-east, winds, may pass this cold season here with advantage. Owing to the close manner in which this place is hemmed in on the sea by steep and high cliffs, it has an atmosphere more completely marine than almost any other part of this coast, with the exception, of course, of St. Leonards, which possesses the same dry and absorbent soil. 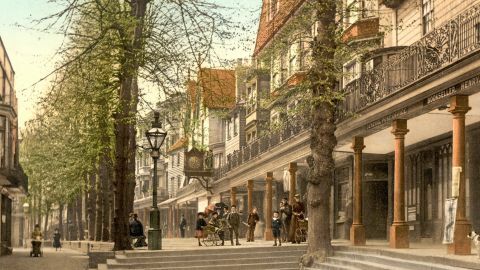 The breadth and extent of its esplanade, also, and the protection afforded by the colonnades for walking exercise, are circumstances of considerable importance to the invalid, and render a conjoined residence at Hastings and St. Leonards a very efficient substitute for a trip to Madeira. The Castle of Hastings, for a time the favourite residence of the Conqueror, has remained a mass of magnificent ruins; its towers, bastions, and ancient Avails forming an object truly picturesque, as seen from any point of view, but looking even grand in their sombre desolation, as meeting the eye of the pedestrian when ascending the eminence leading to Fairlight Downs. A few years back the visitors to the castle were shown two coffins, a small one and a larger one, which they were assured contained the ashes of a mother and infant. These have been lately removed, and the space of ground enclosed by the walls which used to shelter such vestiges of a more barbarous age is now employed by a market gardener to administer to the culinary wants of the townsfolk of Hastings and St. Leonards. The approach to Hastings Castle is from the further extremity of Wellington Square, and, with the perpendicular cliff that fronts the sea for its base, the outer walls appear originally to have had the form of a triangle with rounded angles. For some time past the interior has been laid out as a flower garden and shrubbery, and the person who has charge of the lodge accommodates, for a small fee, visitors with seats and refreshments. The view, though not equal to that from Fanlight Downs, is varied and extensive, and commands towards the south an ample marine expanse, whilst Beachy Head, Eastbourne, and Bexhill may be seen towards the west. Whilst in the neighbourhood, it should not be forgotten that a delightful excursion may be made to Battle Abbey, not more than six miles distant. The grounds are now in possession of the Webster family, who have liberally thrown them open to public inspection every Friday, at 1½ p.m. It is here that the “Battle Roll,” a sort of primitive “Court Guide,” is carefully preserved, and furnishes a list valuable to the antiquary and historian of those families who came over with William the Conqueror. A glance into the booksellers’ windows, where engraved vignettes of some neighbouring attraction allure the eye in every direction, will at once reveal to the visitor the tempting beauty of the environs. A week may be delightfully spent in exploring the fairy-like nooks about Fairlight alone. Situated in a sweet umbrageous spot, down which, by narrow Binding steps, hewn out of the solid rock, one only can descend at a time, is the weeping rock. The view of this constantly-dripping well, as the spectator looks up to the Jutting rock from the beautiful cottage of Covehurst below, is well calculated to inspire the mind with that feeling under which credence would be given to any legend that accounted for this freak of nature, by ascribing it to the influence of supernatural agency. The stone weeps, as it were, from myriads of pores, and, although the water falls in continuous drops, no trace of it is left in the reservoir; passing through the rock, its appearance is as mysterious as its disappearance is magical It is explained by the soil beneath being loose and sandv over a heavy beach stone foundation, and, acting as a subterraneous drain, the water is conducted beneath the surface, appearing as a truculent stream about a hundred yards from the rock, and then again disappearing down a declivity. The beautiful appearance the rock presents in winter, when the drip is frozen and the icicles hang from the sloping crags in clusters of crystals, will not be easily forgotten by those who have had the good fortune to witness, at this period, such a mimic stalactite cavern. 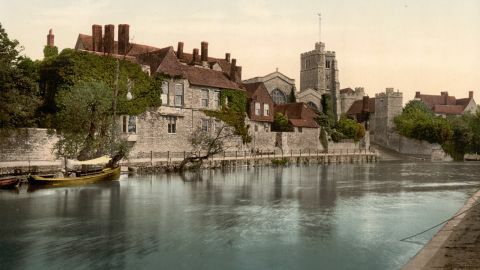 Then, in the vicinity of the well arc the fish-ponds with romantic walks around it, and a comfortable farm-house adjacent, where refreshments can be had at a small cost, and where the ale is – but we forbear our eloquence. The picturesque waterfall of Old Roar should not be overlooked, nor the Lover’s Seat, so charmingly enthroned amid shrubs and evergreens, nor the other favoured localities, which are enough to make a Pennsylvanian lawyer turn poetical. Let the pedestrian, however, in alee his way to the signal house belonging to the coast-guard station at that point, and he will have a panoramic view around him which it would be worth his while walking from Cornhill to Grand Cairo only to behold and then walk back again. The whole forms a complete circle; the sweep of inland scenery extending to the hills in the neighbourhood of London, and the sea view reaching from Beachy Head to Dover Cliffs, between seventy and eighty miles apart, and stretching out to the heights of Boulogne. The entire area of the prospect, both by land and water, cannot be less than three hundred miles. Among many minor objects visible may be enumerated ten towns, sixty-six churches, seventy martello towers, five ancient castles, three bays, and forty windmills. The best time for seeing it is the afternoon, when the setting sun lights up the old town of Hastings in the foreground, and brings into strong shadow the opposite coast of France. Upon favourable atmospheric influences it is, indeed, a view never to be forgotten.